Improve your Bathroom Design and Accessibility with a Level Entry Shower. Let’s say you are planning to renovate, what are the main things you want to do to improve your space? Bathrooms and Kitchens are usually high on Homeowner’s lists. There are many reasons why you might want to remodel, but two popular reasons are to improve resale value, or to tailor your home to your personal needs. If this is your “forever home,” consider not only your needs right now, but for years to come. Aging-in-Place renovations are becoming more popular as many people choose to stay in their homes through their senior years. When a boost to resale value is your goal, a luxurious, spa-like bath will vastly impact the overall value and desirability of your home. A Level Entry Shower is the secret to achieving either of these goals! Level Entry Showers, also referred to as Curbless or Zero-Threshold, offer design flexibility, safety, style, and superior waterproofing. Your home is an investment in your future, and it should reflect your wants and needs for that future. Whether you are building a new home or remodeling, adding a Level Entry Shower to a master or guest bath opens up a myriad of possibilities for your home and your future in it! So you have fallen in love with your home, and plan to grow old with it. When planning to Age-in-Place, safety & accessibility should be your top priority. This is the single-most important benefit of a Level Entry Shower. By removing the curb and properly sloping for drainage, your shower or wet room becomes safely usable to someone with a disability, a wheelchair, limited mobility, etc… When you remove obstacles and open up the space, there are fewer opportunities for accidents. If you, a family member, or your client is wheel-chair bound or potentially could be in the future, it is extremely important to plan for an accessible space now, and avoid costly rush renovations in the future. In addition to a Level Entry Shower, consider adding grab bars, hand-held showers, and shower seats. Additionally, the superior waterproofing prevents leaks, mold, and rot, which can be dangerous to your health and the structural integrity of your home. Level Entry Showers are often seen on Houzz, Pinterest and Design Blogs in a wide array of styles. A Level Entry Shower can be installed in bathrooms big and small, and can be designed however you desire! A Level Entry Shower is like a blank canvas, with unending options for tile design, fixtures, and glass or partition placement. Build shower benches, niches, and knee-walls in conjunction with a Level Entry Shower for customized layouts to fully utilize your space. These showers can accommodate even the most complex tile design concepts. 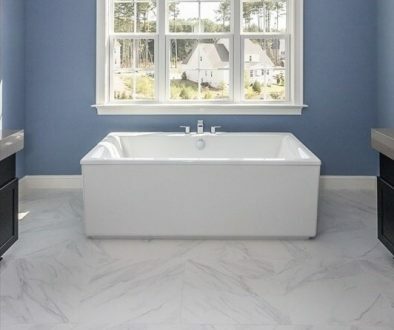 Planning to include a freestanding tub? Put it in the shower! Have an interesting layout in mind? The Level Entry Shower System is all about design flexibility and creating the serene, spa-like bath of your dreams! A Luxurious Level Entry Shower with Freestanding Tub, designer MA Allen Interiors. A Level Entry Shower could open up more options for your layout and increase the space you have in your shower! Take advantage of your renovation to update the style, functionality, and safety of your bath, all at one time! Check out these stunning before and after photos! In this Master Bath Remodel, the small round drop-in Tub was removed and a Level Entry Shower with a neo-angle glass surround was used to create a much bigger shower, far more appealing than the dark L-shaped shower they had before. In this dramatic re-imagined bathroom, a small, dated whirlpool tub was removed to make way for an airy, modern shower. Even with shrinking the window, the new layout and colors brighten the room considerably. It is easy to include a Level Entry Shower when you build a new home. Let your builder know that you are interested in including a Level Entry Shower early on, when plans and budgets are being drawn up. If they are not familiar with the system, direct them to the VIM Products Website for installation information. A Level Entry Shower is a worthwhile investment in a new home, utilizing best-in-the-industry technology and materials to create a long-lasting shower that not only is gorgeous, but also safer for you and your family. Level Entry Showers also can be used in conjunction with luxuries like heated floor systems and steam showers. When building a custom home, you can let your personality and individuality shine in every room! There are several options on the market today for Level Entry or Curbless Showers. The VIM Products Level Entry Shower system was invented by a Plumber and Tile Contractor whose combined experiences resulted in a product that is not only versatile, but long-lasting, and addresses specific needs of both trades. With superior waterproofing and sloping, in addition to unmatched flexibility for use in all sizes and styles of showers, VIM has set the new gold standard for Level Entry Showers. Learn more about their products and installation at their website. A Level Entry Shower is the secret to the stylish, spa-like bathroom you have dreamed about, and it will be safer, long-lasting, and easy to maintain for years to come! Whether you are remodeling or building a new home, a Level Entry Shower is both possible and worth it! 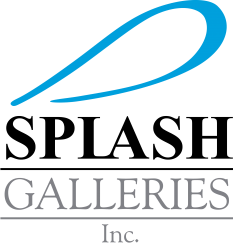 Visit our Showroom to see 4 beautiful Level Entry Shower Display Installations, or if you cannot make it in, check out Splash Galleries Houzz Page for photos and inspiration! All Showers in this post feature the VIM Products Level Entry Shower System.